The Most Rev. Donald J. Hying, bishop of the Diocese of Gary, blesses the site of the new STREAM LAb and Innovation Center set to open at Bishop Noll in Fall 2019. A bountiful St. Joseph’s Table of delicious food served up to guests on March 19 at Bishop Noll Institute was symbolic of the bountiful opportunities that will be served up to students with the completion of the school’s Innovation and STREAM Center, celebrated with a “groundbreaking” and blessing by Bishop Donald J. Hying. “We gather to bless this space and all students who will walk in and have their hearts, minds and spirits be fully engaged,” said the bishop to supporters, staff and students gathered on the surface of the former swimming pool that will be converted into a fully integrated and updated center for Science, Technology, Religion, Engineering, Arts and Mathematics (STREAM) studies. 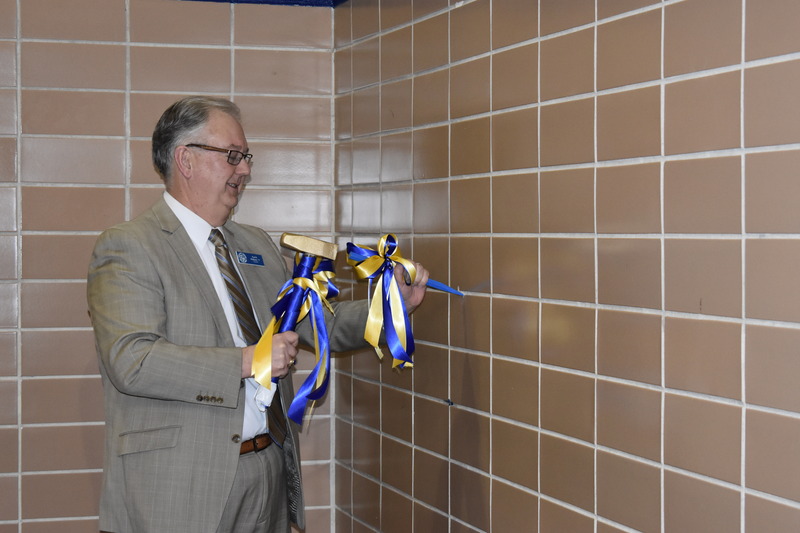 The bishop, principal and alumna Lorenza Jara Pastrick, and other school officials took turns chipping away at a corner of the tile wall with a blue-and-gold chisel and hammer to symbolize breaking “ground” on $1 million in renovations that will begin immediately, with a goal of “being open for classes this fall,” said BNI president Paul Mullaney. 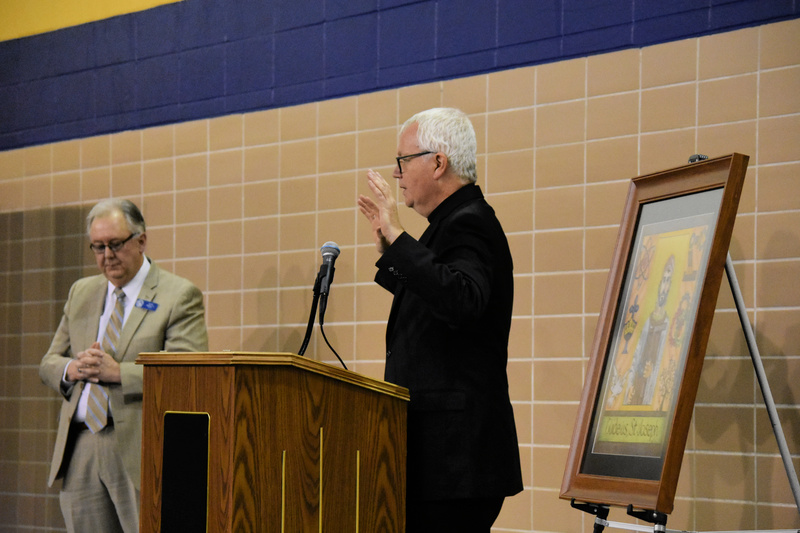 The ceremonies also included the unveiling of a rendering of a 7-foot tall artwork of St. Joseph the Worker, patron saint of the STREAM lab, that has been commissioned from artist and alumnus Christopher Klocek, a 1977 classmate of Mullaney’s. “He works in a medium called intarsia, a type of sculpture using mosaic wood inlay,” explained Mullaney as he displayed an example of Klocek’s work. Mary Albrecht, current Science, Technology, Engineering and Mathematics (STEM) teacher, called it “very exciting” to have computers and design equipment now spread over three separated classrooms brought together in a large, high-tech space that will allow student creativity to flourish. “It will be great for students seeing the entire design process from start to finish in one room,” she said. By having computers from the current STEM classroom, Intro to Engineering lab and computer lab in one space, students will be able to design on the computer, move right to the 3-D printer or workbench, and then go back to the computer to make adjustments. “We hope to get a larger 3-D printer, as well as some woodworking tools (drill press, saw, etc.) and materials to enable students to build what they design. It’s a big space and we want it open to everyone. “If campus ministry, for instance, wanted to build something as a service learning project, they would be able to do it,” Albrecht noted. Currently, freshmen take the Intro to STEM course, and may go on to Intro to Engineering. Albrecht hopes to add Principles of Engineering and robotics to the course offerings. 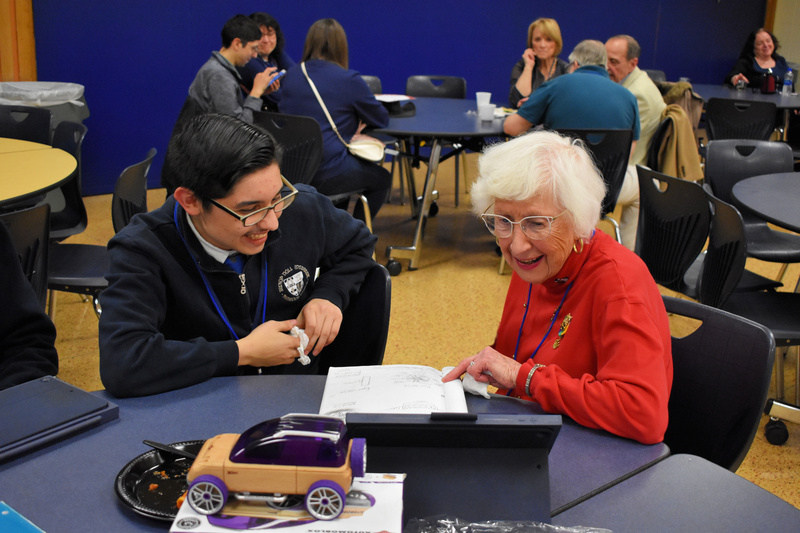 “We also have 27 eighth-graders from five elementary schools in Algebra and Intro to STEM classes, so they can take Intro to Engineering as BNI freshmen,” added Albrecht, who brought several BNI students to the groundbreaking to demonstrate how they are learning to design and make simple “automata” motors. Sophomore Alejandra Castellanos explained the problem solving that went into making a square dowel mesh with a round hole: “We glued the dowel to a round handle that fit through the hole and were able to turn the motor” that made a small sailboat move up and down, and a wave go from side to side. Architect Greg Monberg, a certified learning innovation planner from Wightman Inc. in Benton Harbor, Mich., said the project should have “smooth sailing” with design and construction documents ready to be signed. “This is going to be a marquee program for Project Lead the Way,” he said of the Indianapolis-based nonprofit that develops STEM curricula for U.S. schools. 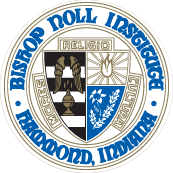 Bishop Noll students chatted with event attendees and shared current STREAM projects with them. Bishop Noll President Paul Mullaney '77 does a ceremonial groundbreaking during the event. 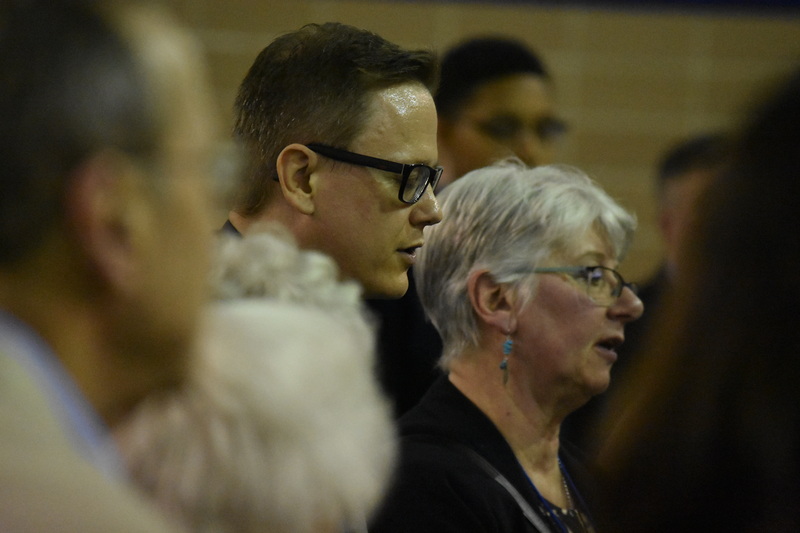 Father Kevin Scalf and retired Noll teacher Mrs. Fredi Conley pray during the blessing. 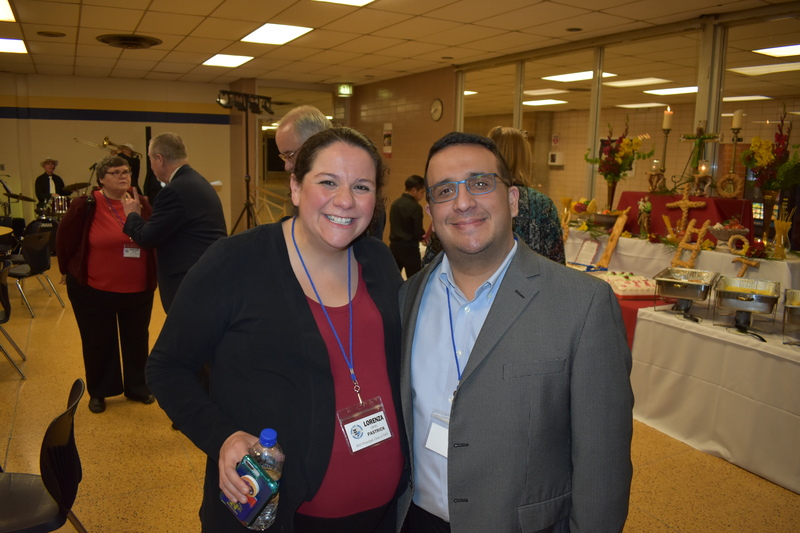 Bishop Noll Principal Lorenza Jara Pastrick '01 chats with St. Casimir Principal (and former Noll Dean of Student) Matt Chico '02.